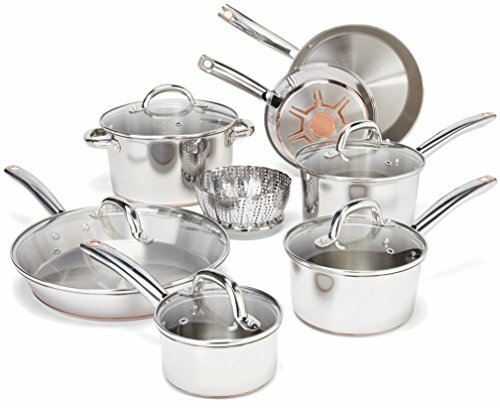 Stainless steel is the gold standard when it comes to a good quality cookware set. 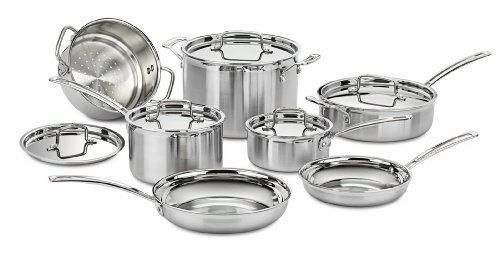 Nothing gets us quite as excited as when we hear “all clad”, “multi-clad”, or “18/10” in regards to a set of stainless steel cookware. There is a good reason for it too. Stainless steel is incredibly durable, safe and healthy to cook with. 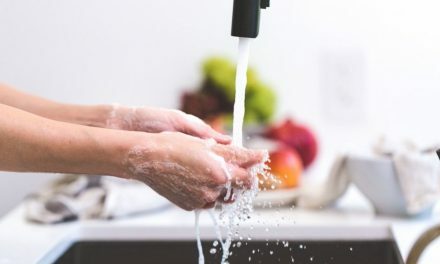 It’s reliable, easy to clean, ages well, and of course, it is incredibly aesthetically pleasing. Unfortunately, trying to figure out the best stainless steel cookware set can be quite stressful, which can lead to people making the wrong choice. When it comes to stainless steel, there aren’t many ways in which you can go wrong. However, there are different features you can consider. 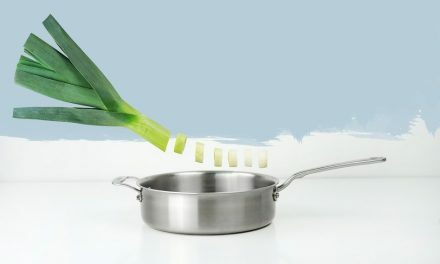 These will not only make cooking with the pots and pans enjoyable, but that will also be better for you when it comes to the safety and longevity of the pan. There are variations such as aluminum based, copper based, aluminum wrapped in copper, triple ply, five ply, multi-clad. There is truly no way of really knowing what all of that means without some research and experience. Lucky for you, you don’t have to make that decision all on your own. In this article, we are going to review the top 5 stainless steel cookware sets that you can get your hands on today. We will thoroughly discuss each and every detail that made it on to our top 5 list. Firstly, we will start with the 13 piece stainless steel cookware set by T-fal. This is the best stainless steel cookware set you can get that has copper on the bottom. The base of each piece of cookware contains a thick high-grade aluminum core. It contains a copper disc that is visible when you view it from the bottom. This combination ensures that you get faster heat up and cooking times with a more even heat distribution throughout the entire cooking process. No more warping cookware or moving your food around the pan to avoid hot spots. 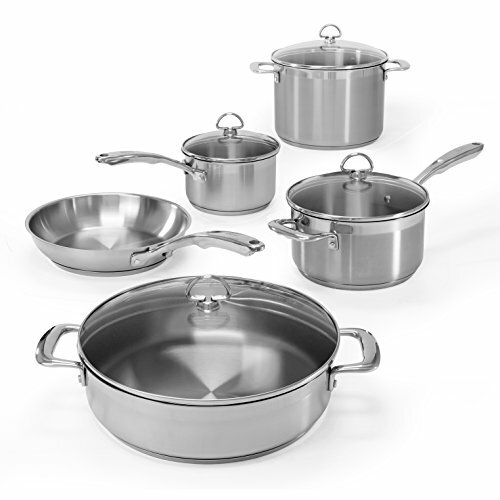 Additionally, the entire set is made out of 18/10 construction which is considered to be the highest quality when it comes to stainless steel cookware. 18/10 refers to the amount of chromium and nickel in the set. It often means that the cookware is more durable to wear and tear over time, more resistant to heat, and will hold its appearance longer without being destroyed by rust or blemishes. This set comes with three frying pans, three saucepans, a stock pot, plus a steamer basket. Each pot comes with a tempered glass lid, with the exception of two frying pans. The tempered glass makes viewing your food while cooking it a lot easier than constantly having to lift up a stainless steel lid. This detail makes it perfect for beginner cooks or those who just want to get the job done as quickly and effortlessly as possible. The handles are riveted to the body so that they stay cool, even when exposed to high heats. Riveted handles are necessary for safety as well as easy handling. The entire set is dishwasher and oven safe and can withstand temperatures up to 500 degrees Fahrenheit. It is also incredibly versatile. Unlike many cookware sets on the market, this one works with gas, electric, glass, ceramic, halogen, and induction cooktops which can be quite hard to find these days. The cookware is designed to appeal to those looking for a more contemporary style. The stainless steel is brushed on the inside and polished on the exterior to ensure it stays looking its best for years. The final deciding factor that made this our number one choice is the price to quality ratio. The price of this set is right in the center range, making it one of the most affordable sets you can get that is made from 18/10 stainless steel and contains a copper core. Not only are you getting a beautiful product that will treat you well in the kitchen, but you are getting a cookware set that you can truly get to know because it is going to last you years to come. It’s an incredible set that won’t let you down. A brands name isn’t everything, but it can certainly help when looking for a new cookware set. When you hear the name of a certain brand, sometimes you just know that you are getting a quality product without even really knowing much else about it. This set is no exception. 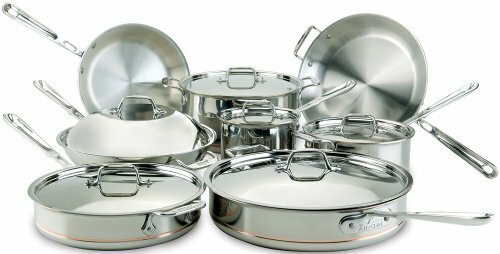 This 12 piece multi-clad stainless steel cookware set is brought to you by Cuisinart, a name that all of us are quite familiar and comfortable with. This is the best quality stainless steel cookware set that is made at an affordable price point, at a professional level. It is sought after by bachelors living on their own, large family cooks, and even some professional chefs. This set is without a doubt one of the most aesthetically pleasing sets available today for the price. The contemporary design of this cookware set features 18/10 stainless steel that has a brushed stainless steel finished exterior. The cookware set comes with 2 saucepans, 2 open skillets, 1 saucepan, a stock pot with a steamer insert, and lids for all. The lids are also made with stainless steel and do not have glass tops. This might seem like a downside for those who like to watch their food when they cook, but stainless steel lids will trap heat, moisture, and nutrients. This makes the food cook faster, stay hydrated, and lose less nutrition in the process. The interiors of the pots and pans are intensely polished so that they resemble the reflectiveness of a mirror. This is an amazing detail that looks incredible but also has a lot of functionality as well. The reflective appearance also creates a surface that is more non-stick than its non-treated competitors. It allows you to separate the food from the pan with ease and less grease. The polished surface is also beneficial when cooking because the steel will not react with your food and alter your flavors. The entire set has been made with triple-ply stainless steel construction with a heavy-duty aluminum core. A pure aluminum core ensures that you retain as much heat as possible, as evenly as possible, throughout the entire cooking process. 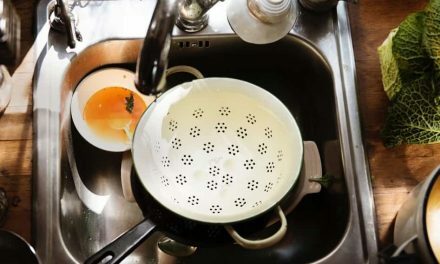 The rims of the pots and pans have been tapered so that you can pour the contents into your serving dishes or storage containers without worrying about dripping and messes. The handles have been attached using stainless steel rivets. They keep the handles securely attached and yet separate enough from the cooking vessel that it stays cool. This ensures that picking up or moving around the cookware while on heat isn’t going to be dangerous. Additionally, the entire set is dishwasher safe, broiler safe, and can be placed in an oven that is heated up to 550 degrees making it one of the most durable units we have reviewed. 50 degrees higher than its competitors doesn’t seem like much, but it can easily mean the difference between a cookware set that is still intact versus one that has been warped from heat. If you have the extra money to spend, this set is easily the best overall stainless steel cookware set that you can get from a brand you trust. It is built with high grade and professional materials, contemporary design, and additional safety and function features. All-Clad is another one of those brands that you hear the name of and instantly feel comforted because you know your time in the kitchen is going to be enjoyable. 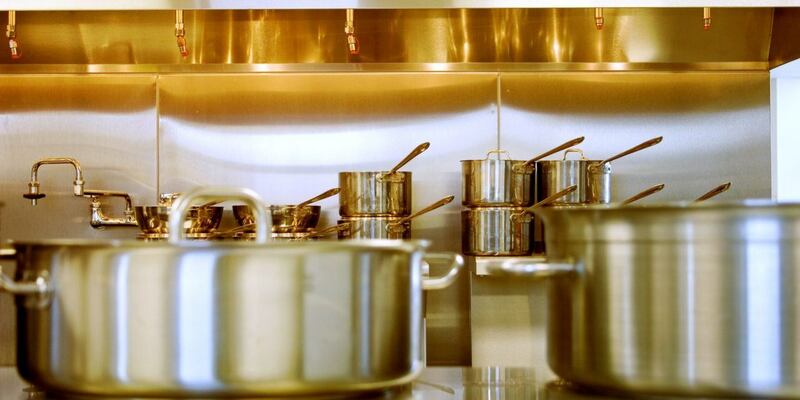 All-Clad is the gold standard when it comes to the best stainless steel cookware. It has proven itself time and time again with its durable construction and undeniable cooking results. Whether you like cooking with stainless steel or not, the quality of this brand has been well established. This 14 piece cookware set is no exception. 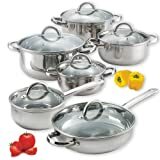 It is easily the best quality stainless steel cookware set that is made in the USA. It comes with two frying pans, 2 saucepans, a chefs pan, and a covered stockpot. Each piece (with the exception of the frying pans), comes with a stainless steel lid that has an easy to grip and maneuverable handle. This particular set is made from high grade 18/10 stainless steel. It contains a bonded five-ply aluminum construction surrounding the core that is made from copper. The cookware is made to look elegant and contemporary with its smooth and thin edges. There is a beautiful copper brand that wraps around the stainless steel pots and pans. It not only showcases this incredible heat conductor but also adds a touch of luxury to the set. Each piece has a flared edge so that you can transfer your food from the cookware to your desired eating or storage vessel. The handles are long, smooth, riveted and comfortable. They stay cool and comfortable, even in the middle of high-temperature cooking sessions, because of their vented and contoured design. The polished stainless steel cooking surface (which is also called the starburst finish by All-Clad), ensures that you have no negative interactions with the food. This is good because it prevents the steel from altering the flavor of the food. It also makes for a cooking surface that is resistant to sticking, without requiring too much oil. 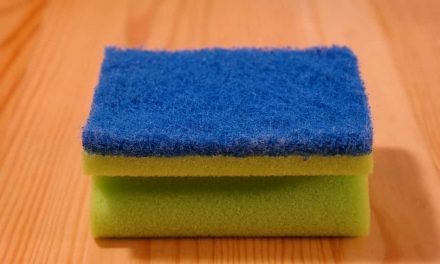 This also makes it really easy to clean once you are done cooking. The set is dishwasher, oven, and broiler safe. It has the ability to thrive in temperatures up to 600 degrees, while its competitors are warping around 400 degrees. It can also be used with all types of cooking tops such as induction, gas, electric, and ceramic. Additionally, the entire set is made in the USA for those who want to support a local company. If you are an advanced cook, someone who loves cooking, or someone who is looking for a quality set that is made in the USA, look no further because All-Clad is the highest value when it comes to high-quality cookware sets. Brand certainly isn’t the only important aspect when looking for a new cookware set. However, with All-Clad, you know that the quality and reliability lives up to the name. The only downside to this brand and this particular set is that it is quite expensive. If you are looking to save some money but don’t want to miss out on the All-Clad name, there are smaller sets available that come in at a lower price point. If you are looking for good quality at an affordable price, then the Cook N Home 12 piece stainless steel cookware set is probably the one for you. This is hands down one of the best stainless steel cookware sets that is affordable for any budget. At the same time, they managed to deliver an incredible level of quality. The set includes one saucepan, three casserole pots, a stockpot, and a frying pan. Every piece of cookware comes with its own tempered glass lid that is fitted with steam vents to control heat, lock in nutrients, and allow you to see your food while you are cooking. Glass lids are incredibly beneficial for those who don’t want to keep lifting the lid to check on their food. This can prevent missing any issues such as burning due to lack of visibility. This cookware set is made out of 18/10 stainless steel that has been polished to create a beautiful shine that is sure to look great in any kitchen. The 18/10 steel ensures durability, and it’s safer to cook with because it is food grade. The smooth steel interior of the pots and pans allows for a relatively stick-resistant cooking vessel, which can make cooking and cleaning much easier. This type of construction also allows the cookware to be placed in an oven up to 500 degrees without the lids, and 350 degrees with the lids. The set (including the lids), is also dishwasher friendly, making clean-up even easier. The handles are riveted to the body to ensure they stay cool during the cooking process. They are easy for anyone to hold. The base of this cookware set is made from an aluminum disc that is wrapped between layers of 18/10 stainless steel. The aluminum provides better heat distribution when cooking but is coated in enough stainless steel on both sides to prevent it from leeching into your food when cooking. If affordability is the most important aspect on your wish list and you really aren’t looking for any extra bells and whistles, then you don’t need to look any further. This set is without a doubt one of the most affordable stainless steel options available. You are getting a fantastic set for the price as you are not sacrificing quality for the savings. You are still getting top grade 18/10 stainless steel construction with a core that was designed to prevent hot spots and slow cooking times. The Chantal 9 piece cookware set is an up and comer in the cookware market. It is slowly making its way into kitchens worldwide, and for good reason too. This is the best stainless steel cookware without aluminum that you can buy that is still made with durable stainless steel. Aluminum is an essential part of stainless steel cookware as it adds durability and provides more evenly distributed heat. However, many people worry that aluminum isn’t safe. While the studies are unclear, for those who are wanting to cook aluminum-free, you now have a really great option available to you. This unit is also nickel-free which can be a fantastic option for those with allergies to nickel. This cookware set is made from 12/10 Japanese stainless steel that has been melted with copper to increase heat up times, overall cooking time, and heat conductivity. Additionally, titanium has been added to the copper and steel mixture to give the pots and pans more strength and durability so that they hold up over time. The level of chromium in this set is a bit higher than most, which makes the steel less likely to corrode over time. With the polished stainless steel interior, you should never have to worry about metallic flavors interfering with the food. Braising, searing, and deglazing should be a breeze. The cookware set comes with two saucepans, a saucepan, one frying pan, and one stock pot. Each individual piece comes with a lid with the exception of the frying pan. The lids are made with tempered glass so that you can easily monitor your food while it is being cooked, without letting out any unnecessary heat or moisture. The pots and pans have a pouring rim so that you can transfer your food without worrying about making a mess. The handles are designed with comfort in mind. They are smooth, rounded, and the perfect size for easy handling. They have been riveted to the cookware to ensure that they stay cool while cooking and attached, even when the pots and pans are at full capacity. What makes this set so unique is that it is aluminum-free while also being induction ready. Additionally, it will work on all other types of cooktops such as gas, electric, and ceramic. The set is oven and dishwasher safe, but the lids can only handle up to 375 degrees in the oven. This is quite high but definitely something to be aware of when cooking with them to avoid damaging the set. If aluminum-free cookware is your number one requirement when looking for a stainless steel cookware set, then there really isn’t any reason to look any further. This set will provide you with all the necessary features you need to have a smooth and safe cooking experience. However, this set comes in at a much higher price point than the other units. With the addition of high grade Japanese stainless steel and incorporated copper, it pays off. Whether you walk into a kitchen store or search stainless steel cookware online, chances are you get overwhelmed pretty quickly. It doesn’t help that when you are in the store, you often need to pick up each individual piece to ensure that the handle is comfortable, that it isn’t too light nor too heavy, that the materials are truly high quality, and that it is compatible with your cooktop. Sometimes, this is impossible to do in a store depending on how the product is packaged and displayed. The amount of information listed on the box usually isn’t enough. Shopping online definitely has the upper hand when it comes to finding out accurate information because you have access to customer reviews and testimonials, as well as more detailed information that you might have not otherwise had access too. The last thing anybody wants is to spend a ton of money on a set that is marketed as high-quality, but later find out that it’s made out of light and cheap materials and potentially isn’t even compatible with their cooktop. Shopping for the best stainless steel cookware set in a storefront can be far too much unnecessary effort when it comes to the modern day consumer. We are incredibly busy and we want fast and reliable results that will hopefully last us a lifetime. If you are trying to upgrade your current stainless steel cookware set or are making the switch from a different type of cooking material, one of these five sets is sure to tick all the boxes on your wish list. We hope this review shed some light on the benefits and downfalls of the top five stainless steel cookware sets. It is our goal that you are walking away feeling more confident and ready to dive into the exciting and wonderful world of high-quality stainless steel cookware sets, knowing that you made a well-informed decision. How to clean your stainless steel cookware. The benefits of using stainless steel cookware. How to use your stainless steel cookware for best results. Whether stainless steel cookware is safe.